American Airlines car hire & Douglas DC-6B aircraft. Homepage. This page: Two interesting old airline boarding passes, one promoting American's car hire options. Although both of these items relate more to an airline of the 1950's rather than the automobile, there is a tenuous link to motoring. 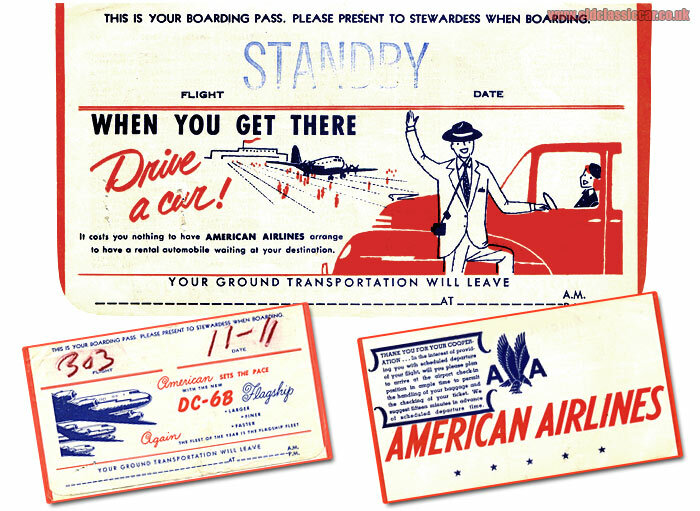 Both of these boarding passes were issued by American Airlines in 1951, and the cover of one promotes their car rental service. "When you get there - Drive A Car!" it says, "It costs you nothing to have American Airlines arrange to have a rental automobile waiting at your destination". The illustration shows a smiling gent, with a camera hanging from his shoulder, waving as he joins his wife inside their hired motor-car. In the background, a classic airliner - similar to a Stratocruiser - discharges its passengers to the apron. The print date code for this boarding pass dates to April 1951. A second pass, dating to May 1951 this time, promotes the recently-introduced Douglas DC-6B airliner. American was the first airline to put the four-engined passenger-carrying DC-6B aircraft into operation that year. The -6B was a development of the original DC-6, designed with passenger carrying as its role. Unlike the DC-6, it didn't have a cargo door, and therefore could get away with a lighter-weight cabin floor. New, more powerful, Pratt & Whitney R800 "Double Wasp" engines, incorporating water injection, were also fitted on the new variant.